The students held flags with an eagle silhouetted on a red background, the symbol of the UFW. 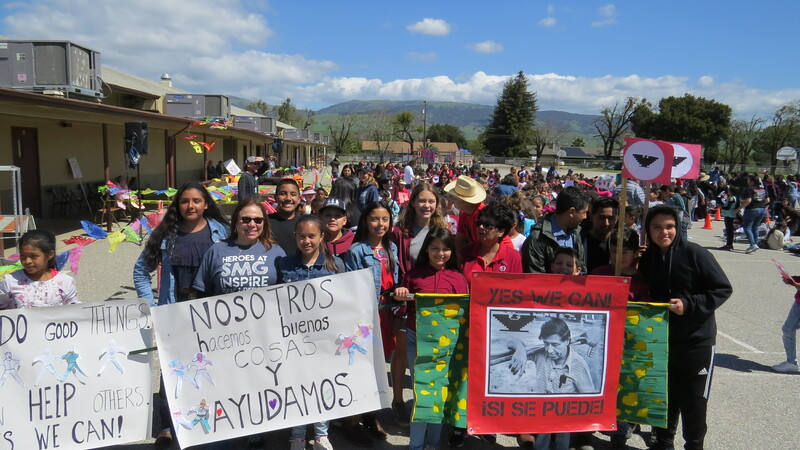 On the bed of an old farm truck, a musician sang songs from the period, followed by speakers who addressed the elementary school children about Chavez’s legacy and why it’s important to continue to strive for social justice. Among them was Cesar Chavez’s daughter, Sylvia Delgado, and his grandson, Anthony Chavez. Anthony started a slow rhythmic clap and the kids joined in. The clap grew faster in pace. “That’s it. Sí, se puede,” Anthony said.